Pure white petals with an ivory centre. Erlicheer is a harbinger of spring with a highly fragrant group of small double flowers atop each stem. Great for cut flowers or just leaving in the garden for a beautiful fragrance. 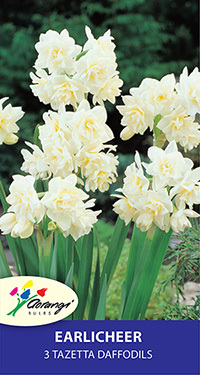 Plant the bulbs 8-10 cm deep and 10-12cm apart, in good free draining soil and ensure that they receive plenty of sun. Please login to Your Account to view pricing.